TS Junior Panchayat Secretary Exam Date 2018: Telangana Panchayat raj & rural development has announced Recruitment Notification 2018 For fill 9355 Posts of Junior Panchayat Secretary. Telangana State Panchayat Raj Department is going to be held Junior Panchayat Secretary examination on 10th October 2018. This year the department had issued notification for a large number of vacancies. Candidates waiting for TSPRI jobs can utilize this opportunity and apply for the Jr. Panchayat Secretary Posts can apply through online at tspri.cgg.gov.in. The department has announced 9335 junior panchayat secretary posts. Hence the applicants seeking to get the Telangana state government jobs can proceed to apply from 3rd September to 15th September through the TS Panchayat Raj portal. Aspirants seeking to check more details such as eligibility criteria, selection process, application process, important dates, and other details from the following article. Also, candidates can download Telangana Jr Panchayat Secretary Notification 2018 PDF form, application form the following attachments. Telangana State Panchayat Raj Department is the state level organizer of the panchayat department. The department annually releases various job notifications to hire the suitable people into various designations. 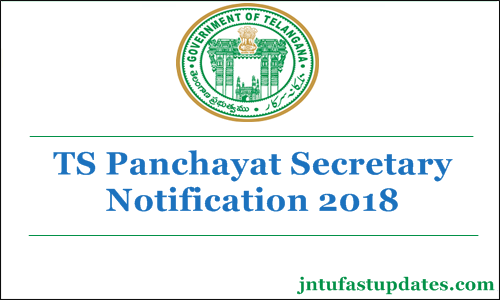 This year the Telangana State Panchayat Raj has issued notification for 9335 junior panchayat secretary posts. Candidates having the suitable eligibility criteria can apply for the posts from 3rd September to 15th September. Candidates having the minimum educational qualification mentioned below can apply for the Telangana Junior Panchayat Secretary posts. As per the notification, the applicant’s age limit must between 18 to 39 years. Hopefuls applied for the TS Jr Panchayat Secretary posts will be shortlisted through written test and interview rounds. Selected candidates will get a good pay scale as per the norms of the Telangana State Government. Applicants check more details from the brief details mentioned below. Applications are invited online for the post of Junior Panchayat Secretary from the eligible candidates. Online applications are available on the website: http://tspri.cgg.gov.in. Candidates may apply online from 03.09.2018 to 15.09.2018 and last date for payment of fee is 14.09.2018. Total No. of Vacancies are 9355. District wise details of vacancies, eligibility, scheme of examination, fee details, reservations, general conditions etc. are available on http://tspri.cgg.gov.in. Ts panchayat Secretary Examination to be conduct on 10th October 2018. హైదరాబాద్‌: తెలంగాణలో జూనియర్‌ పంచాయతీ కార్యదర్శుల రాత పరీక్ష తేదీలో మార్పు చోటు చేసుకుంది. సెప్టెంబ‌ర్‌ 28 జరగాల్సిన రాతపరీక్షను అక్టోబరు 10న నిర్వహించనున్నట్లు అధికారులు తెలిపారు. జూనియర్‌ పంచాయితీ కార్యదర్శుల నియామకం కోసం దరఖాస్తు గడువును మరో రెండు రోజులు పొడిగించారు. సెప్టెంబ‌ర్ 11వ తేదీతో ముగియాల్సిన దరఖాస్తు ఫీజు చెల్లింపు గడువును ఇదే నెల 14వ తేదీ వరకు పొడిగించారు. సెప్టెంబ‌ర్ 12వ తేదీతో ముగియాల్సిన దరఖాస్తు గడువును ఇదే నెల‌ 15వరకు పొడిగించారు. దరఖాస్తు చేయడంలో ఎదురవుతున్న ఇబ్బందులపై ఫిర్యాదుల నేపథ్యంలో ప్రభుత్వం స్పందించింది. మంత్రి జూపల్లి కృష్ణారావు సూచనలతో గడువును పొడిగిస్తూ నియామక ప్రక్రియ కమిటి కన్వీనర్ నీతూ ప్రసాద్ ఉత్తర్వులు జారీ చేశారు. Must have passed the Degree from any University in India established or incorporated by or under a Central Act, State Act or a Provincial Act or an institution recognized by the University Grants Commission as on 31.8.2018 and must possess working knowledge of computers. To apply for the Telangana Panchayat Secretary posts will have to pay the application fee as mentioned below. General Candidates must pay Rs. 800/- (Rupees Eight hundred Only) and SC,ST,BC (Non-Creamy layer candidate), PH & Ex-Service Men must pay Rs.400/- (Rupees Four hundred only) towards Examination Fee. The B.C candidates who comes under Creamy layer also pay Rs.800/. Candidates must have to clear all the selection rounds to get the posts as Telangana Junior Panchayat Secretary. THE SELECTION OF CANDIDATES FOR APPOINTMENT TO THE POSTS WILL BE MADE BY EXAMINATION (OBJECTIVE TYPE) BASED ON OMR. THE FINAL SELECTION FOR THE POST WILL BE BASED ON TOTAL MARKS SECURED IN THE WRITTEN EXAMINATION OF PAPER-I & II. i). Aadhar card or other ID proof as indicated in application. ii). Proof of Educational Qualifications. v). No Objection Certificate from Employer (if anywhere employed) vi). Other certificates if any. Visit the TSPRI official website, tspri.cgg.gov.in or click on below direct links. Click on Telangana Jr Panchayat Secretary Application form 2018. Attach the required scanned copies of documents. Pay the application fee through online using any debit/credit cards. Finally, check the application thoroughly and submit the application form. Application acknowledgement will be sent for the applicants. Take a printout of it and keep it safe. 2. Edit application will be provided in two phases. Sir 10th October na RRB exams undi sir .please date change cheyanidi sir. Sir nenu fees pay chesanu kani naa application form submit kaledu sir please reply ivvandi sir. sir pls suggest specific publications book to refer for exam urgently.